It may seem early in the season to begin thinking about winter, but the unfortunate reality is that it comes quicker than you think. Before you know it, we’ll be picking pumpkins! Last winter was particularly nasty with more days of snow than we’re used to here in New York, though we didn’t get hit as badly as some other areas. We had more days below freezing than normal and some rough storms that took down trees and knocked out power. 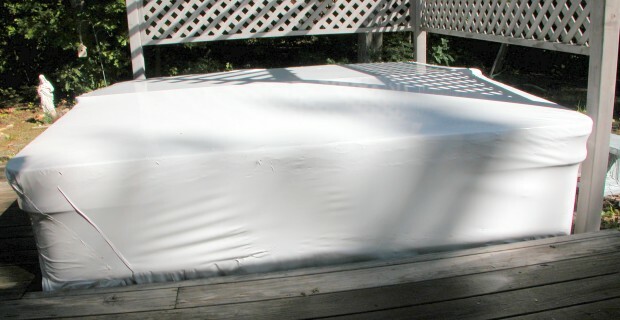 For many of our customers, the biggest headache came when they went to open up their spas for the first time this spring or summer and saw that their hot tub had sprung a leak. The first thing that a spa owner needs to think about is whether or not they will use their spa during the winter season. There is nothing quite so relaxing as sinking into a nice hot spa in chilly weather with a light snowfall on the ground or a crisp clear evening viewing the stars, but if your spa is located at a summer home, or will not be used over the winter months, you can save a lot on your home energy bill by closing your spa for the winter. Improperly winterized hot tubs can collect water that, even in small amounts, can cause catastrophic damage to a hot tub’s plumbing and pumps. When even the slightest amount of water is left in the plumbing or is allowed to get in because a spa was not wrapped properly, that water can and will freeze. Each time the water freezes, its expands and puts cracks in the plumbing, the fixtures and the expensive pumps. Save yourself the possibility of a costly repair and have your spa winterized by a professional who will remove all water from the spa with a vacuum and wrap it so that no water can get in. It will save you a headache and a very costly repairs. Call our office and have your winterization and shrink wrap scheduled for this Fall today and always make yourself familiar with the Maintenance section of your Spa Owner’s Manual. Stay tuned for further Spa Maintenance tips from us at East End Spa and Sauna.